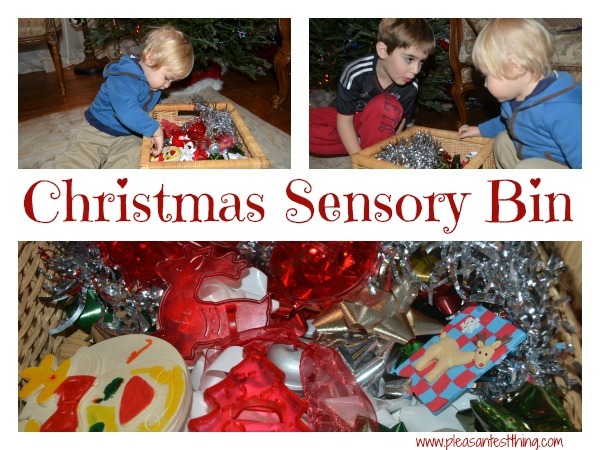 My almost 5 year old and I put together a Christmas sensory bin for my 17 month old today. It came about because I had all the wrapping stuff out, and the boys were having fun looking through the bows. 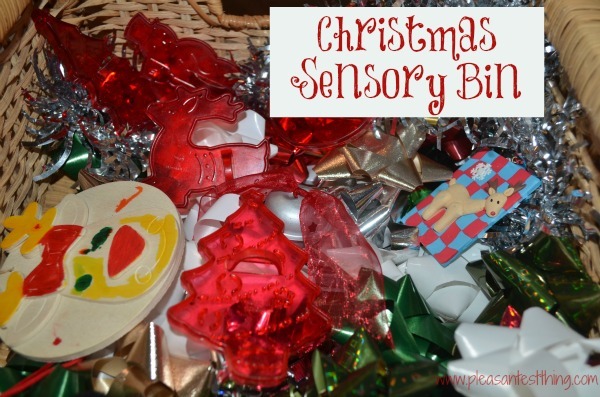 That lead to a quick scavenger hunt for my older son to put together a basket full of Christmas themed items safe for his brother to play with. This was a spur-of-the-moment idea, and it was a fun way to get both boys engaged. I let the boys pull out items from the bin. As they held them and played with them, we discussed what the items were, how they felt, what they did. Mostly, though, they just played. As always, especially when using things not designed for babies and toddlers, be sure to watch them carefully as they explore.